Midfielder Dale Stephens said there were no excuses after Brighton & Hove Albion crashed to a 5-0 Premier League defeat at home to Bournemouth this afternoon. The Seagulls remain five points clear of third-from-bottom Cardiff after the Bluebirds lost 2-0 away to Burnley. Albion host Cardiff at the Amex on Tuesday in a huge game to try to move themselves closer to safety. Dan Gosling gave the Cherries the lead after 33 minutes, before Ryan Fraser made it 2-0 just before the hour. 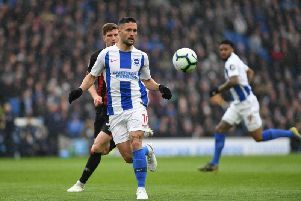 Anthony Knockaert was shown a straight red card for a wild lunge on Adam Smith, before Bournemouth added three more goals through David Brooks, Callum Wilson and Junior Stanislas. Speaking to Match Of The Day afterwards, Stephens said: "It's a very disappointed changing room. We're all very disappointed. The midfielder added Albion would make no excuses and said: "It's a bad, bad day. "Bournemouth played well and we didn't. We didn't build on what we've been doing well this season.